My sweet friend, Erin, of Why Not Sew has just published her first book, "Sweet Tweets", through Martingale. When Erin asked if I'd be part of the blog hop, I was thrilled! I have loved Erin's quilts and sewing projects for a very long time. She is an inspiration to me! This book combines my love of quilting with a free motion technique that allows you to "draw" with thread. I had a great time making the tote bag and the placemat. Erin has instructions for the crochet trim in the book and it was fun to pick up a hook and learn to make the trim. The instructions in the book are clear and the pictures are just lovely! I have an extra copy of the book to giveaway to one lucky reader. Please leave your email address in the comment section and I will pick a winner on Friday. Sweet Tweets! Erin's style is so sweet; I'd love to have a copy of the book! The book looks lovely. I have always admired Erin's work. Thanks for the Giveaway. I am loving this blog hop and feel inspired by everyone's lovely projects! I love the idea of adding crochet trim (which I hope to learn someday). What a wonderful giveaway. The crochet trim certainly sounds like something I would like to try. I love your little tote bag, especially the post card on it, and the lovely placemat. Thank you for the giveaway chance - I'd like to try that applique technique she uses. 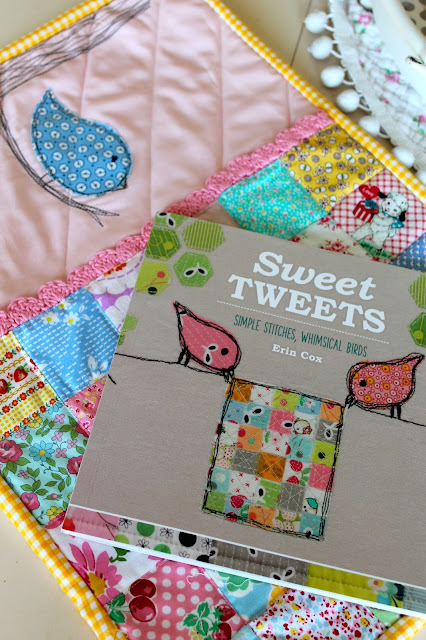 I've seen such cute projects made from this book, including yours! Thanks for sharing! The bag is so adorable! 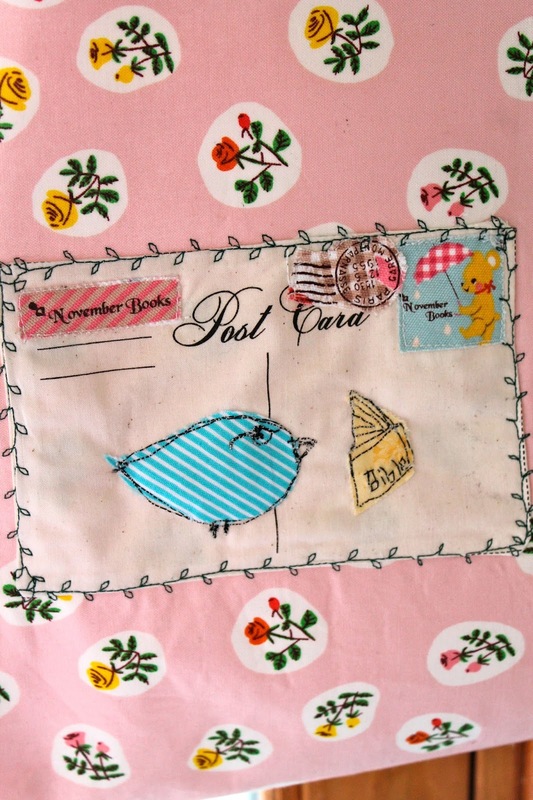 Where did you find the postcard fabric? Just adorable. Love all the colors. What a treat to win this book. I love what you have done with the designs. Do you remember what your solid pink is? I have trouble finding a soft pink that is not too "sweet" and your choice looks like a winner! Great HOP! Thanks for a neat BOOK GIVEAWAY! THANKS! Love your little tote and all its embellishments. There have been the cutest projects on the bloghop. Looks like a great book! I have followed you for a long time and greatly enjoy your work. The book looks so nice and the projects look easy. Thank you so much for a chance to win! The bag is so cute. I would be thrilled to win this book. I just love anything related to little birdies! Thanks for the giveaway! I love your tote, and I'd love to win the book. What a fun book! And I LOVE your tote. Saw it on Instagram ;-) My contact info is available when you click on my name. The items you created from the book are super cute! 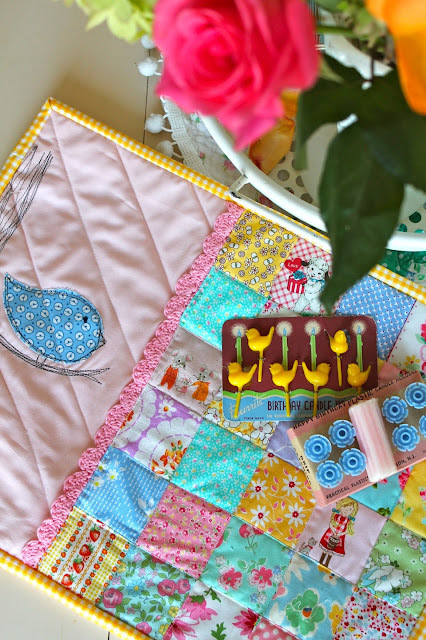 These birdie projects are so very cute. Love your bag. I'd love to win that book. I adore your projects from the book! Beautiful! The little birds are the cutest! I would love to win this - my last name is BIRD! Cute bag! I love all the projects in this book and would love to win a copy! Love all these ideas! Thanks for the chance! Cute cute cute. Love making little bird quilts. Love the projects I have seen so far. Your bag turned out so sweet! I'm inspired to make one for my granddaughter, who turned 7 yesterday and is just beginning to read. Thank you. The little birds are very cute, especially on the bag. I love useful makes. I always forget about using those decorative stitches on my machine. Your's is divine. Very sweet! I love anything with birds! Wow,your work is lovely and so cute.Lovely giveaway too,thank you for the chance to win it. What a fabulous project - so sweet!! What a gorgeous bag! I love it! It truly is sweet! Thanks for sharing! I love this and thanks!! What cute little birds! And the bag is quite stunning!! Looks like a sweet book!!! I love to make surprise gifts and there are some perfect ideas in the book!! I am just in love with this book!